I found the cutest little children’s book ever at a garage sale for 50 cents. It’s titled Let’s Eat by Gyo Fujikawa. 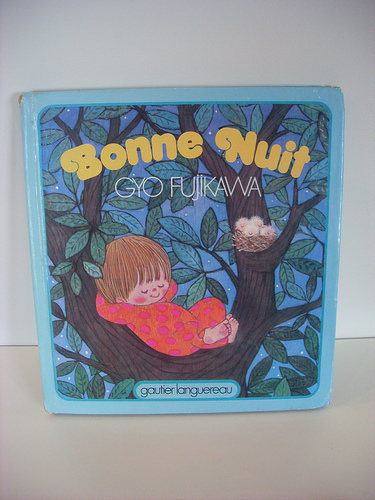 The illustrations made me feel very nostalgic for my childhood. And the first thing I noticed was how racially diverse the characters were, there was even a little Chinese girl feeding baby chicks. She is so humble and lived to be 90 years old! I would consider her a pioneer in the world of female children’s illustrator. I just wish I could draw half as good as her. Well, I can’t seem to find any images on the net of my book. But I did find others, Bonne Nuit, a French version of Good Night from lucychan80s flickr. The illustration os so nice, I may want to scan it and maybe print some to frame. I also found out that the books have been out of print, but Amazon.com has many used book dealers selling the same book from $20 to $160. I guess I now have a collectible in my hands.